Detroit Mercy’s world-renowned paleontologist Nizar Ibrahim might be best known for unlocking the mystery of the Spinosaurus, the predatory, sail-backed dinosaur so large it even surpassed the better known Tyrannosaurus rex in body length. But to him, the discovery is just one piece in a much larger puzzle. “We’re trying to resurrect an entire ecosystem,” explained Ibrahim, who joined the University’s Biology department as an assistant professor in August 2018. That particular ecosystem is what Ibrahim calls “the river of giants,” which existed roughly 100 million years ago in what is now the Sahara Desert. Ibrahim’s research reveals a lush river system, home to monster-sized beasts that included crocodile-like predators the size of school buses, huge fish and flying reptiles with wingspans that would dwarf even the largest birds alive today. For over a decade Ibrahim has led international research teams on expeditions, amassing thousands of fossil specimens, representing a wide range of different organisms. Ibrahim’s fascination with the Sahara, a place he calls, “one of the last real frontiers,” began during his youth in Germany, when he learned about Ernst Stromer, the pioneering German paleontologist who discovered the first dinosaur fossils in the Egyptian Sahara shortly before the beginning of World War I. More than a half century later, when Ibrahim was in search of an interesting Ph.D. project, he remembered Stromer’s findings, and realized the Sahara certainly fit the bill. He embarked on an ambitious thesis project at University College Dublin, which included visits to fossil collections on three continents, as well as expeditions to North Africa. But figuring out where, exactly, to look in the desert, so vast it encompasses over 30 percent of the African continent, required Ibrahim to put his detective skills to the test. Not only did they return alive from their expeditions — they always returned with treasure troves of fossils, including a giant upper arm bone of a long-necked plant-eating dinosaur Ibrahim found on one of his first expeditions. It is, to this day, one of the largest dinosaur bones ever found in this part of the Sahara. During a research trip to Morocco, Ibrahim encountered a fossil hunter — one of tens of thousands in the country — who showed and sold him a handful of bones that he later came to believe may have belonged to a Spinosaurus. When Italian colleagues told him about fossils in Milan that had recently been acquired from an unidentified Moroccan fossil trader and shared similar, unique features to Ibrahim’s, he soon realized they might have come from the same individual animal. He traveled to Italy and confirmed the match — suggesting that crucial information on the geological context of the fossils could be collected. In addition, if the fossil trader had uncovered that much of the skeleton, more of it might be waiting to be found, if only the seeker knew where to look. But the only person who could point Ibrahim toward the site was the fossil hunter. He could remember the man’s face, but didn’t know his name or where he lived. He began visiting Moroccan villages along the Sahara in hopes of tracking him down, a needle-in-the-haystack quest. He was on the verge of giving up when, as he sat at a café, the man walked by; Ibrahim went running after him. Hesitant at first, the fossil trader eventually agreed to take Ibrahim to the place where he had unearthed the partial skeleton. With a specific destination now identified, Ibrahim quickly assembled an international team to recover information on the dig site and piece together a reconstruction of Spinosaurus. Using their discoveries, the fossils that started the quest, Stromer’s sketches and modern technology, Ibrahim and his colleagues were able to add a substantial amount of information to our knowledge of Spinosaurus. Ibrahim has made numerous trips back to the Sahara in the intervening years, as he continues to piece together what life was like in the region in the days when dinosaurs reigned supreme. Recent discoveries include fossil snakes, narrow-snouted crocodile-like hunters, and remains of predatory flying reptiles, known as pterosaurs. Ibrahim’s National Geographic Live show, “Spinosaurus: Lost Giant of the Cretaceous,” which he has presented throughout the United States and Canada, offers audiences a truly immersive experience and a rare opportunity to “visit” the lost world of the Cretaceous Sahara, some 100 million years ago. Ibrahim’s multimedia shows feature artistic renderings as well as CGI imagery of what the prehistoric Sahara looked like, complete with cutting edge animations of ferocious dinosaurs. 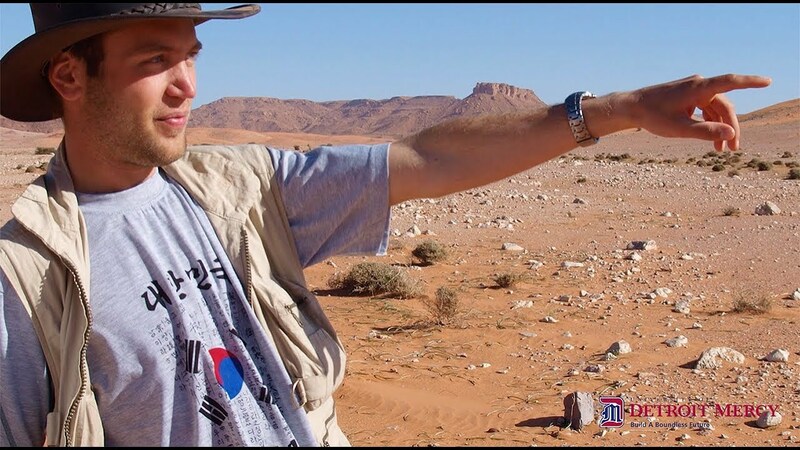 Ibrahim also offers insight into the challenges of a Saharan expedition and how his discoveries continue to impact our understanding of dinosaurs and the strange ecosystems they lived in. Through his work, he hopes to spark a curiosity about the prehistoric world, as well as the larger world of evolutionary biology and anatomy. “Exploring these ancient worlds puts the present into context,” he explained. “We live on an evolving planet. Right now, we’re experiencing major changes. What happens if our sea levels rise? What happens if we wipe out most of the biodiversity of our oceans? What happens if we lose many of our important forests and rainforests? Conversely, he pointed out, even if mankind does everything right, our species will not last forever. “A meteorite brought the ‘age of dinosaurs’ to an end,” he said. “Similar events will happen again in the future, and we would just be gone. And that’s when we realize how vulnerable we actually are. Even without such extraordinary events, species do not last forever. Before joining the faculty at Detroit Mercy, Ibrahim did his post-doctoral work in bioinformatics, anatomy, and paleontology at the University of Chicago. 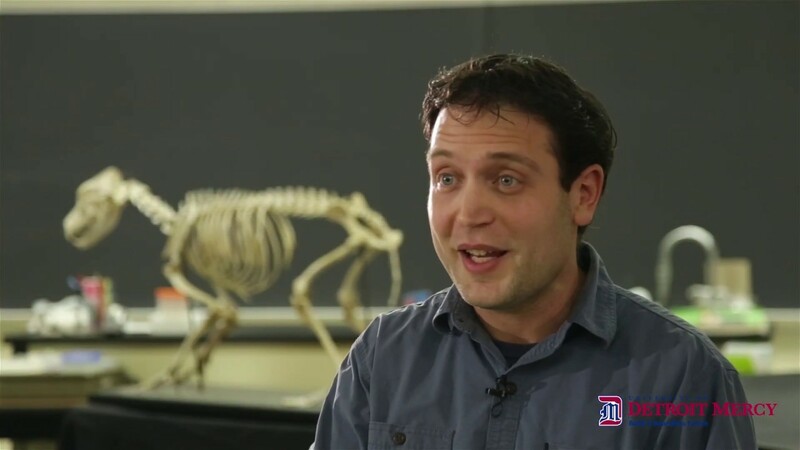 When a position opened up at Detroit Mercy teaching anatomy and evolutionary biology, he jumped at the opportunity. Being able to teach something so closely aligned with his passions is important to Ibrahim. Additionally, he felt the resources available in Detroit, like the Detroit Zoo and the Belle Isle Aquarium, and central location to other cities with major research resources, like Chicago and Toronto, offer a great benefit. Ibrahim – whose teaching responsibilities include Evolution, as well as Comparative and Human Anatomy – wants to awaken in his students the same enthusiasm he feels for the natural world. “Some people almost go through science education as something they have to do, to then do something else,” he said. “I’m trying to open their eyes and make sure that students don’t forget or lose this incredible sense of wonder. There is no question in my mind that the history of Life on Earth is the greatest story out there, hands down”. By Amy Skimin. Video by Jonathon Rhodes. Artwork by Davide Bonadonna. Follow Detroit Mercy on Facebook, Twitter and Instagram. Have a story idea? Let us know by submitting your idea.